In 1493, when Christopher Columbus sailed into the Caribbean island now known as Puerto Rico, he was warmly greeted by the Taíno inhabitants while hundreds of noisy bright-green parrots with beautiful white-ringed eyes, which the Taínos called Higuaca, swooped overhead. It is estimated that the beginning of the sixteenth century, there were nearly a million of these beautiful birds living in the all major habitats of Puerto Rico and the adjacent smaller islands of Culebra, Mona, Vieques, and possibly the Virgin Islands. Today there are less than thirty Amazona vittata living in the wild on the island. Although there are future plans to expand the wild population to other locations on the island, at the moment, the 28,000 acre (19,650 hectare) Caribbean National Forest, known locally as El Yunque, is the sole remaining forest habitat where the few surviving wild Puerto Rican parrots find trees with cavities suitable for nesting and seeds and fruits to forage. Of the three parrot species that inhabited U.S. territory at the turn of the twentieth century, all but one, the Puerto Rican Parrot became extinct by the 1940’s. The decline of the island’s parrot population over five centuries is directly related to the rise in human population. As more colonists arrived, they cut-down forests and converted land for agriculture. The habitat on which the species depended began to disappear. The remaining parrot population, which had retreated to the Luquillo Mountains, was further threatened when the cutting of forest timber for charcoal production was encouraged beginning in the 1900’s. The story of the last-ditch recovery effort to save this extraordinary bird from extinction is an amalgam of scientific intervention, agency cooperation and management strategy, which started as a gamble with no guarantee of ultimate success. In 1968, when the Puerto Rican parrot population had dwindled to around two dozen individual birds in the wild, a concerted mutual effort to save the species was launched. 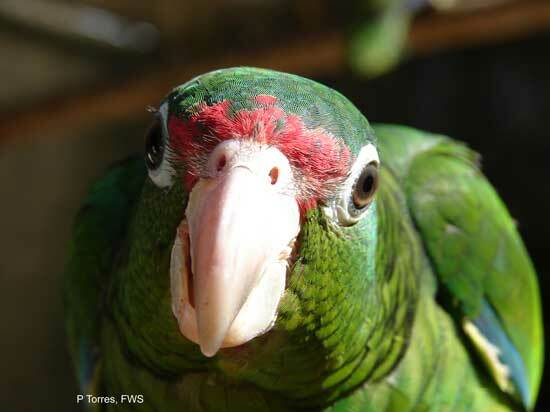 Called the Puerto Rican Parrot Recovery Plan, it involved scientists and managers from the US Fish and Wildlife Service, the US Forest Service and the Puerto Rico Department of Natural and Environmental Resources, with added support provided by the World Wildlife Fund. By 1989, the Puerto Rican Parrot Recovery Plan had been in operation for over a decade. Through scientific intervention the parrot population in the wild had increased to 47 birds. In September 1989, Hurricane Hugo roared across the Luquillo mountains, destroying more than half the parrots in the wild. By year’s end a small population of 22 birds remained. By early 1994, the wild population had again risen to 39 birds and 6 breeding pairs. Today’s parrot population continues to hover near to that level.